a email of it,..,.its that possible? Kathy Whitson - go to the doctor . . .. Urgent care will run you $60 if you don't have insurance - well worth the peace of mind. I am 49 I was visiting my parents, I have been bit about 7 times by a black dime size round (like a marble) spider it had very small legs which was a bit wierd looking. I do not see it in photos. I have been ill ever since day 4. I do not see it on the pics. Bites are swollen red itchy. I just don’t know if this is what’s making me sick.. nauseous, headaches, vomiting, shaking exhausted  I have other health issues not sure what to do. I found a 1/2” beauty on my hummingbird feeder-doesn’t resemble anything pictured. It is grey, fuzzy, and it has long black & orange tiger-striped legs. Most interesting is the erect upward jutting fat triangular tail (look like it took a honeybee’s tail) that is bright orange with a dk grey smudge on its top side. Can I shoot u. Pic of it? Florida found small brown spider on my jasmine bush pot. Solid color skinny legs and small white spots on back. Didn't see anything above that matched it. Maybe 3/4" total. Plz help identity, teeny tiny red spiders with fat body's all over my house! I live in Florida. Thank you! Sorry, I'm the one that wants to send a pic, shoot me an email if you would? Hi, got a good sized fella living in my livingroom, can I send you a picture? Maybe you can tell me what kind he is. I found 3 spiders this week in my daughters room they're black with red heads, fairly small. I found all of them in the daytime. Any information would be super helpful, also we're located in Florida. Thx in advance. I'm a little concerned today I found the third spider this week in my daughters room it's black with a red head, fairly small. I found this one on my daughters curtian, and the other two on the tile floor. Any info would help. Also we're in Florida, thx in advance. I have a photo of the spider I shook off my covers this morning. Can I send it to you for info? I'm in Okaloosa county, FL. It's dark brown with a black or darker brown button-hole pattern on the back or top as I look down. It's only moved 2" in small increments in 2 hrs. Would you mind if I send you a photo of an unusual spider who's been entertaining me with its web making skills for the past week. Its growing and looking scarier, I have no idea what it is. Brown belly and long legs with yellow and black markings. Not sure if poisonous. I'm in Nassau, Bahamas. Spiders are the best insects in the world! I love them.But my aunt doesn't! WeirdAUNT !!!!!!!!!!!!!!!!!!!!!!!!!!!!!!!!!!!!! I think I've been bit by a spider. I knocked it out of the air at the store and it must have landed on my foot. I now have a place on my foot that is swollen, burning and itching. The spider was tiny and looked clear. Any suggestions as to what kind of spider and if I need to see a doctor? Can you tell me what type of spider is brown,big,and only has six legs? I found 5 of them in a tent that got left in the woods on accident. I live in north Florida right next to the Georgia boarder. I think I just saw a bunch of medium yellowish spiders that looked kinda like a Spitting Spider.... I'm not sure though. It didn't spit or jump but it had yellowish skin, couldn't see color of eyes, six legs. Found a big spider around my front door. It has a round bottom looks white with six yellow dots Aligned with light brown legs that turns black before attaching to body. Looks pale yellowish never seen one like it before. I took pictures of it. I received your email and responded through email. etc. and was overall a dull brown in color. I do have one good digital image. a salticid. I'd love to have you take a look at it Dave. Thanks. I found a spider in my garage web was fairly large it was brownish black legs lighter color hughabdomen it rolled up in a ball when disturbed. It also had some white dots on its back. Ilet it go not shore I should have? What do you think it is? Several years ago, in Winter Haven, FL, I saw a large spider in the office where I worked. It had a small body, about 1/4 inch by 1/2 inch, and long legs -- when stretched out it was probably about 2 1/2 inches in diameter. It was black and fuzzy. It looked exactly like someone had tried to make a "pretend" spider out of black pipe cleaners! My boss caught it in his handkerchief and took it outside. He said it had lived in the office a long time. Anyone have an idea what it was? I killed this spider my cat was about to attack , and i looked up the description of what it looked like , but cant seem to find anything on it . It had a black body , tan legs , and an orange stripe on its beck . I'm trying to identify a spider in palm beach county florida. Any idea about what it is? It's a colony of many webs with many different levels of the same type spider all in one low lying cabbage palm. It looks more like a condo or nest than just a round spiraled web. I have a picture but I can't paste it on your board. Thank you. Thanks for helping identify my Spiny Orbweavers, very interesting. Send the photos using the link above. 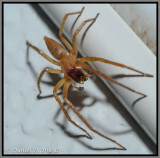 do you review photos and ID spiders? do you actually supply any info of spiders. an do you review photos? You should call a pest control operator. the size of my small finger. I didn't count the legs or their position. Please help. Thank you. I will be looking forward to suggestions to one of my many dilemmas. sheetrock and fiberglass were wet with mildew. Over 100 small red spiders no longer tha my large thumbnail. They were very active. Please help. i have a greenish gray spider with a smile face on its back the eyes are two yellow dots and the mouth is an orangish red color. what type of spider is this? is it poisonous? I have a spider in my mail box, it's a yellowish color with long legs and a fat end. I'm not sure what kind it could be. We have spiders inside our pool lani that is black with red claw like feet. I have been unable find any pictures similar to identify it. Can you help? @Kelley, most spiders here in Florida aren't dangerous. The fat brown spiders that make their webs at night, I believe those are Purseweb spiders, but I could be wrong. Nonetheless, no more dangerous than a bull ant or honeybee. The most dangerous ones in Florida are Widows and Brown recluses. Both are very prominent and hide very well. Brown recluse bites often end in skin grafts if not treated promptly. Black widows attack the muscles and joints and are excruciatingly painful. my daughter lives in Pensacola Florida and she sent me this pic of a very scary looking spider that she almost ran into face to face that hang in the tress around her garage apt. very daunting...but we can't figure out what kind it is and if it is dangerous? I thought I could paste the pic here but it won't let me. On a cool nite, there was a taupe colored Long legged spider on my taupe colored front door, near a light. He may have been heat seeking or insect hunting by the light, but scuttled off as I approached. He was 4 to 6 inches in diameter and had legs about the thickness of wooden matchsticks. He was back again about 5 minutes later. I bought a yellow bug light the next day. His body size was small and roundish in comparison, about dime sized. I don't see his picture. Clearwater, Florida. What is it? I rarely answer questions from this site. I live in Pinellas county Florida while at my friends house I was bit by a spider that was gray in color and looked like tree bark the bite stung when it bit me now I have a half dollar size rash a week later can you tell me what kind of spider it is. Please tell me what a sm. brown and black striped on back with 4 red or orange spots on the other side. Did you see this spider bite her. If it was very small, it's doubtful that it could break through the skin. Spider bites on humans are extremely rare...We are not a food source. on it and brown in color can anyone tell me what is was please. I HAVE SEEN A FEW HALF DOLLAR SIZED BLACK SPIDERS WITH WHITE STRIPS/SPOTS AND 2 VERY DISTINCTIVE GREEN MARKINGS ON THE FRONT THAT RESEMBLES EYES. WHAT KIND OF SPIDER IS IT. THANK YOU FOR HAVING THIS SITE, IT HAS HELPED ME TO IDENTIFY A NUMBER OF SPIDERS I HAVE SPOTTED IN MY YARD. saw a gray spider, it looked like it has a hard shell body. what could it be? Hi, I live in Homestead, So. Fl. . Recently, our mini Dashund was bitten or stung by one of our local critters.We did not see or hear the attack however we sew the result. He developed a pingpong ball sized knot on his throat and sevear swelling around the bite. The vet. was able to save him but unable to identify the culpret. We have seen Bark Scorpions, and what appear to be Wolf or Huntsman Spiders in the past. The bite left a bb sized black wound that ozzed for several days. Any ideas would help. We have a fat bodied brown spider with a light brown pattern on her back. She only comes out @ night builds a web & in the morniing the spider & the web is gone. Can't seem to find her picture anywhere. Do you know what kind of spider I'm trying to describe? She doesn't appear to be aggressive. I have these little spiders in my room, they have never harmed me and they happily eat the gnats that come into my room from my Rabbit's cage. They are small, with very large abdomens and they have legs like "daddy long leg" spiders. They are kind of a light brown, they are NOT widows. Crab spider photos? Did I miss it? in the shape of a face and then on the outside of the yellow were little red colorings which made the whole under side look like a sunburst. No one could tell me what it was, can anyone out there? Thanks to your site I found the id of the biggest spider I've see, a Giant Lichen Orbweaver, wow! It really is magnificent, I just hope I don't run smack dab into the middle of it in forgetfulness. Janet Douglas, it sounds harmless. If it is not a widow and not a recluse then you will be fine. widows and recluses do not have tan strips. It is probably just a house spider. Look up house spider and see if you can find a picture of it. Ok, We were in the shed getting my daughter's stuff out and along the wall was this medium to large dark brown spider with a tan stripe that went from front to back and in the strip looked like a bunch of x's or something close. I have been trying to find out what it is. We live in Lake City, Florida and have many spiders but every now and then we find one we are not sure of. This site really helps most of the time, just not this time. I need to know so I know whether I have to kill it or not. It did not bother me and I was careful not to disturb it so right now we are on good terms. IT HAS BEEN 22 YEARS SINCE I MOVED ACROSS THE COUNTY, BUT I STILL MISS GREETING MY RESIDENT SPIDER BY THE POOL EVERY MORNING. IT WAS SMALL AND IRIDESCENT; QUITE BEAUTIFUL. NEVER COULD IDENTIFY OR GET A PIX. CAN YOU HELP? Nice site...I am certain I have a Huntsman Spider. Looks exactly like your closeup of the head shot, but I must have a juvenile, because it is only about 2" or maybe 2.5" if I were to spread him out. Thought it was a Brown Recluse at first...but thanks to your site, I am certain it is a Huntsman. Thanks. I came across a mated pair of spiders today and unfortunately they had chosen my gate latch to build their web, so I had no choice but to kill them, admittedly in my ignorance, because I didn't know for sure if they would deliver a bite that could prove dangerous to me or the other people using the gate. I would love to know what they were. The male was Jet Black, very thick body, about the size of a quarter and had a very bright green metallic spot and a white spot. The female (I assume) was the same shape but her coloring was pale almost pinkish and yellowish. After looking at these pics I would possible say theyre jumping or purse web spiders, but I dont see any with that unique metallic green and white spot. Any help? Very informative and great photos, Thanks. One morning after moving to Dixie County, FL. I met up with the largest spider I have ever seen. I think it was hosting babies on its back. Anyway they all scattered, the body of the host was about 4 inches, it ran and so did I but every ao often I would see it, but what I keep thinking about was the number of babies it was carrying on it's back. Do you know what kind of spider this could have been? I would really like to identifing this thing. Thanks, email:fireflyfarms@hughes.net. found a huge spider in my house. Looks like 5 legs fair;y large body. don't know what it is. no red. Was on the ceiling in the corner rear legs down and looking like it was going to jump on something. Any idea what it is. I killed one a few weeks ago and now I have another. If i can find it again I'll take a picture of it. Congrats, top quality collection. Thanks for sharing.